After Elle posted that the Theory outlets were having an extra 40% off items I decided to head to my local outlet for some shopping. 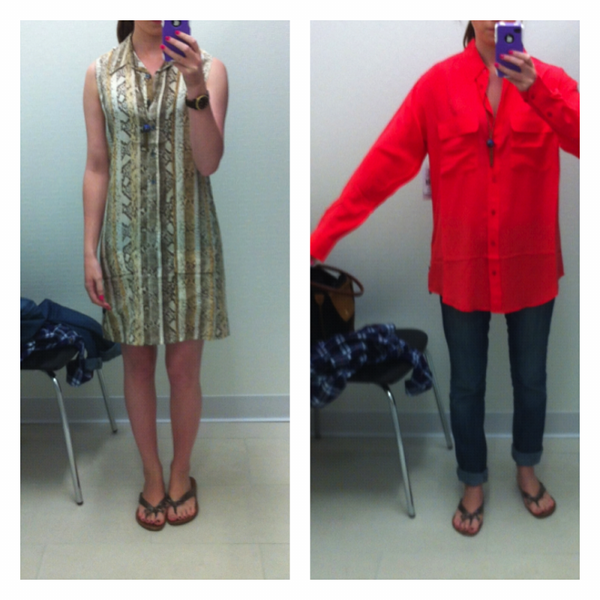 I was pleasantly surprised by the amount of good stuff at the Saks Off 5th Outlet. They had racks of Equipment items, Clover Canyon, and Rebecca Taylor. These are all brands that I've been interested to try, but this was the first opportunity I've had to try them on in person. First up are the Equipment items I tried. I was soooooo excited when I saw the racks of beautiful silk blouses and dresses. 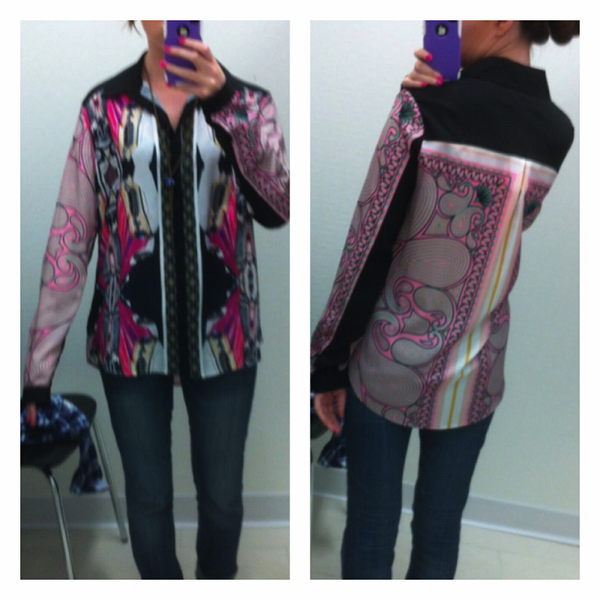 I've always wanted an Equipment blouse and was really happy to see many colors to choose from, and reasonable prices. 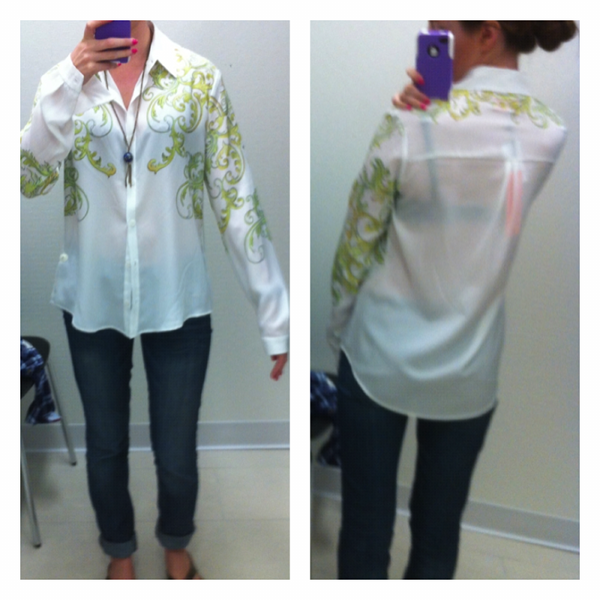 The blouses were all either 109 + extra 30% off or 119 + 30% off. Ebay prices are not usually much better than that. Unfortunately, I realized the brand runs very large. 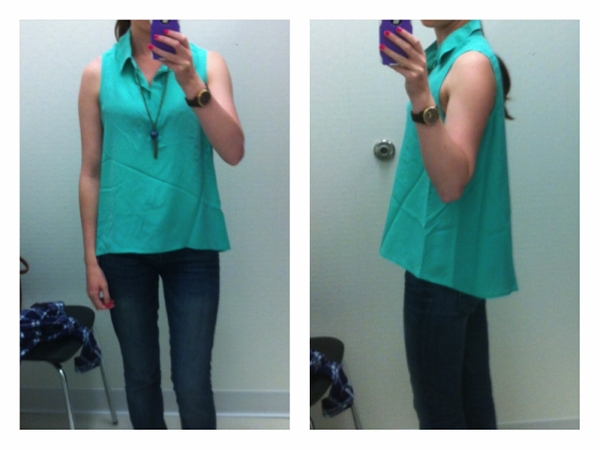 I'm trying on size XS in the photos below... I guess I can stop checking Ebay for Equipment shirts now because it's never going to happen for me :( .... unless I get a sleeveless blouse, maybe. Above: Equipment Blouse - Don't know the style name. Now for some Clover Canyon items. I was first introduced to the brand when Jean bought her beautiful dress. I wouldn't say I've been dying to own anything from the brand, but if the price was right I'd consider making a purchase. My overall impression is that the brand runs small. The XS blouses fit me in the shoulder and the arms wouldn't need slimming, but they were just slightly long in the arm but that's expected for a short person like me. The dresses run very tight, but I think they would be great for after hours and dates. The prices were not that great for the blouses below, but I put the dress on hold because I checked Ebay and the dress was cheaper than what Ebay sellers are selling it for. However, after walking away to shop more I never ended up coming back for it. I'll consider purchasing a dress in the future but only if I can get it for around $150 or less. Preferably less. 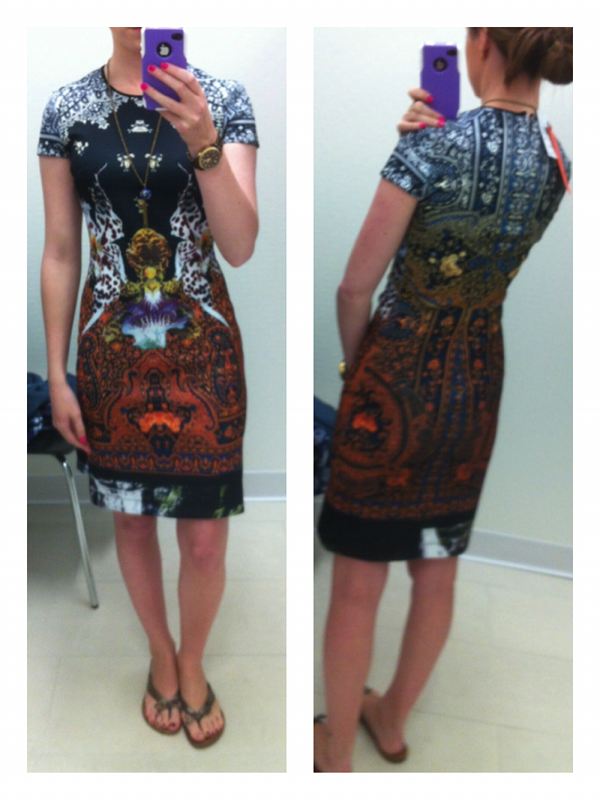 I also put this dress on hold because it fit me great and I thought it would be great for work. The only problem was the price tag. I was THIS CLOSE to justifying spending my entire monthly clothing budget on this one dress, but after I put it on hold at Saks I went into Last Call by Neiman Marcus and found 2 Theory dresses which also fit me great for the same price as one Rebecca Taylor dress so I had to pass it up. Maybe it will end up in my hands some day! Do you have any experience with any of these brands? What are your thoughts on Equipment, Clover Canyon or Rebecca Taylor items? Worth the price? Do they hold up over time? 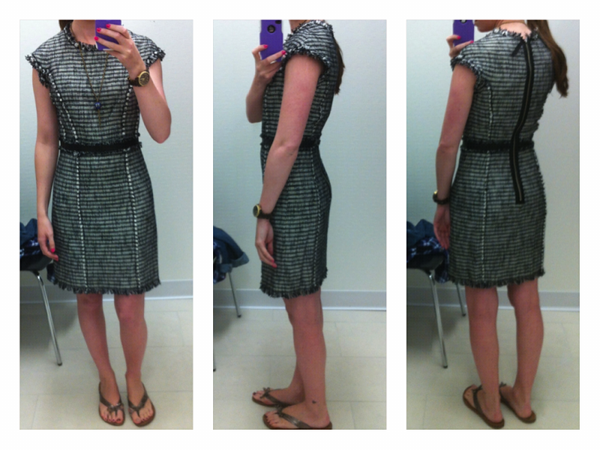 Oh, I LOVE that Rebecca Taylor dress! Too bad it was so pricey. I love that Clover Canyon dress- you can totally make that work appropriate by adding a sleek black blazer . And then easily transition into night by ditching the blazer and adding a fun leather jacket!